Will Ménière’s disease patients benefit from vestibular rehabilitation? 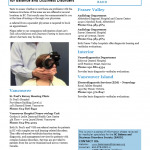 You are here: Home / FAQs / Will Ménière’s disease patients benefit from vestibular rehabilitation? Vestibular rehabilitation usually doesn’t help in the early stages of Ménière’s disease. Patients will have attacks that can neither be predicted nor be kept under control with exercises. Vestibular rehabilitation doesn’t work well when a patient’s condition fluctuates–that is, good hearing and balance between attacks and poor during attacks. With continued attacks, patients lose much of their hearing and balance. Once the balance function is greatly diminished and doesn’t change a lot when in or between attacks, the patient is a candidate for vestibular rehabilitation. If a patient has lost balance function on one side, the brain can be trained to compensate for the loss; however, it takes practice.